In New York, title to real property can be transferred from one party to another by executing a deed with full covenants. A deed with full covenants conveys fee simple interest in real property to the named grantee with the greatest assurance of title. Deeds with full covenants are statutory under NY Real Prop. Law Section 258 Statutory Form A. This form includes specific covenants that the grantor holds title to the property and has good right to convey it; that the grantee "shall quietly enjoy the said premises," which means that the grantee has the right to use and enjoy the property without disturbance from claimants; that the property is free from encumbrances (with the exception of any noted in the deed); that the grantor will "execute or procure any further necessary assurance of the title"; and that the grantor will defend the title against all lawful claimants (NY Real Prop. Law Section 258 (Statutory Form A)). A deed with full covenants offers the highest protection to the grantee (buyer), covering the entire ownership history, even preceding the time the grantor obtained title. 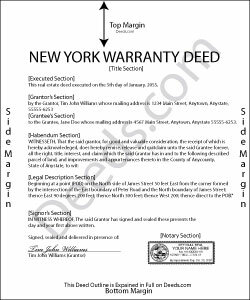 This warranty is greater than that of a bargain and sale deed, which, at most, may contain a covenant against grantor's acts (that the property conveyed is without encumbrances made by the grantor). Deeds with full covenants also provide more surety than a quitclaim deed, which offers no warranties of title. A lawful deed with full covenants includes the grantor's full name, mailing address, and marital status; the consideration given for the transfer; and the grantee's full name, mailing address, marital status, and vesting. Vesting describes how the grantee holds title to the property. Generally, real property is owned in either sole ownership or in co-ownership. As with any conveyance of realty, a deed with full covenants must meet all state and local standards for recorded documents. It requires a complete legal description of the parcel, including the section, block, lot, and unit numbers. Recite the prior deed reference to maintain a clear chain of title, and detail any restrictions associated with the property. Sign the deed in the presence of a notary public or other authorized official, then record it at the county clerk's office in the county where the property is located for a valid transfer. Contact the same office to confirm accepted forms of payment. Most counties in New York require a recording page to accompany all documents for recording. This cover page is available on the local county clerk's website, and it factors into the total page count when calculating recording fees. Pursuant to R.P.P. Law 9-333.3, all conveyances, excluding deeds of oil and gas or mineral rights, require a Real Property Transfer Report. Use Form RP-5217-NYC for real property transfers within the five boroughs of New York City, and use Form RP-5217 for real property transfers in all other counties. Contact the local county clerk's office to confirm the specific county's requirements. This article is provided for informational purposes only and is not a substitute for legal advice. Speak to an attorney with questions related to deeds with full covenants or any other issues associated with transfers of real property in New York.